The difference in geology between York and the Wolds landscape to the east becomes apparent when you notice, in the fields, the mole-hills. The amount of earth a mole can churn through has always impressed me – more so these Wolds moles, burrowing through soil studded with white chunks of chalk. 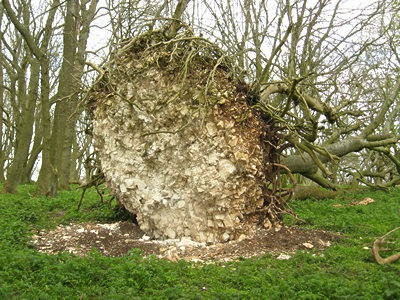 The amount of chalk in this landscape became apparent as we passed a small copse, where a tree in the centre had fallen. It had a large expanse of root – a great plate of root. From the other side, what I would normally call a root-ball, but this was more like a plate, flat and wide, with an underside apparently of pure chalk. 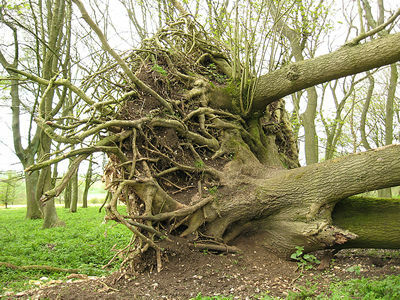 The tree, it seemed, had pushed its roots outwards, in search of earth, had found none, and had eventually toppled. By Lisa @YorkStories • 27 April 2012 Beyond York To link to this page's proper location please use the > permalink.